Britain’s shoreline is about nine thousand miles long. Many people who wish to spend a holiday on Britain’s coast would perhaps simply be looking for a sandy beach to sunbathe on, where the children can go paddling safely. The Living Coast, however, with its 376 aerial photographs of Britain’s shoreline, shows that there is so much more to it than those crowded beaches. A mere glimpse at the eleven little images on the back cover will give a taste of what is inside; these eleven include the Needles, Groyne at Prestatyn, St Ives, Barrisdale Bay and Rumps Head. 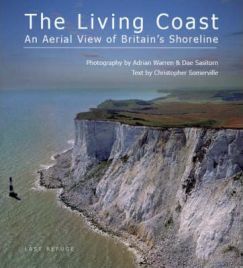 The front cover has a spectacular photograph of the white cliffs at Beachy Head, towering beside a lighthouse. Author Christopher Somerville opens The Living Coast with his poem entitled “Great Ship,” opposite an image of the north-east coast of Hoy at Quoyness, Bay of Quoys, Orkney. The photograph shows a patchwork of fields beside tranquil waters, with moody grey hills behind. A smoky cloud hangs over the scene; it is a suitably diverse rural scene with which to start the book. Photographers Dae Sasitorn and Adrian Warren provide the foreword to the book, recounting how they set off in a Cessna 182 from a grass strip in Somerset on their photography trips. Their comment that “for a small group of islands, Britain’s coast has a richness in variety that would be difficult to match anywhere else” tells us that we can expect to be surprised and delighted by The Living Coast. The Living Coast is then divided into fourteen chapters each devoted to a stretch of coast. The first, entitled “Ancient Land,” looks at Land’s End to Morte Point. After that, the voyage takes us round Britain’s coast in a clockwise direction, finishing with Chapter XIV, “Sandstone to the West,” covering Dawlish Warren to the Isles of Scilly. The chapters range from twenty to thirty-four pages in length, and each begins with one or two pages of text by Somerville. All the photographs are in colour; some take up almost a full page, while others are afforded only a third of the page. A grid reference and map reference is given for each one, as well as a paragraph of text describing the wildlife or a little of the history of the location. Somerville even includes one or two literary references; for the photo of Warkworth Castle, for example, he gives two quotations from Shakespeare. As the journey starts in the south west, there are many images of rural areas beside rocky beaches that we can feast our eyes on. Several images provide a contrast, however, such as the geometric lines of the Severn Bridge; Somerville comments that they remind some people of the sails of a ship, while others see the strings of a Welsh harp in them. The Welsh coast also offers some stunning rural scenes, but there is a fascinating image of a caravan park in Porthcawl, Bridgend. It must be a soulless place, but the aerial view creates an intriguing pattern where some caravans are parked diagonally and others in horizontal rows. As we move up to Scotland, there is plenty to delight in. The aerial view of the islet of Haskeir reminds me of the shape of Britain itself. In a detail of St Kilda village, the remains of the walls of abandoned houses form an intricate pattern against the green background. The colours in some of the images here are stunning, for example the greens, deep blue and earthy brown in the photo of Westayre Loch and Beach at Sanday, Orkney. Similar tones are seen again in the image of Blakeney Point in Norfolk. As we came round to the south coast, I was waiting to see which areas of the coast that are most familiar to me would be shown. I was amused by Somerville’s description of the entrance to Langstone Harbour; he sees Eastney’s tip as “the rhinoceros proboscis” and the south-west tip of Hayling Island as “the horned sheep’s head.” My only disappointment was the lack of a photo of Man o’War Bay from Dorset’s Jurassic Coast, as it had impressed me so much when I first saw it just over a year before. The images of Kimmeridge in Dorset, however, are breathtaking. At the end of the book several pages of maps the locations of the places photographed, which I found extremely useful. Then comes an index, and the final page gives information about the author, photographers and publisher. The photographers have published other titles featuring aerial photographs of Britain that are not confined to views of the shoreline. All the photographs that appear in The Living Coast are available from www.lastrefuge.co.uk as high-quality prints. Author Christopher Somerville writes for the Daily Telegraph and other national newspapers. He has published over thirty books, among which are the books for the BBC’s Coast series. Photographer Dae Sasitorn is manager of the publishing house Last Refuge Ltd; she is involved in post-production of images and book design as well as photography. Adrian Warren is a professional pilot and award-winning maker of environmental and wildlife films. The Living Coast has made me realise how little I actually know of Britain’s shoreline. It has made me feel that, if for some reason I was told I could never travel abroad again, I could have many wonderful holidays here discovering wonderful areas of coastline that I have yet to set eyes on. The photographs are of a superb quality, as is Somerville’s text. There are so many images to take in, and although I know I will never visit all the places I would like to, I can learn so much about our coast from this book and take pleasure in doing so. 2 Comments on "The Living Coast: An Aerial View of Britain’s Shoreline"
Thank you so much for this really wonderful review of The Living Coast. It was an absolute labour of love, and a particular pleasure for me to work with two people as dedicated and brilliant (and delightful) as Dae and Adrian. I’m very sorry to say that Adrian died shortly after The Living Coast came out, so in a way the book stands as a memorial to one of the most remarkable photographers and film-makers that this country has ever produced. My pleasure. It’s a wonderful book that has inspired me to discover more of our coastline, and I am so glad that you like my review. I was sorry to hear of Adrian’s death, but the book is certainly a superb memorial to him.